With 26 Gigabit Ethernet ports, the LGS326 26-Port Smart Gigabit Switch from Linksys is a business-class switch designed to handle a heavy workload while remaining easy to configure and manage. 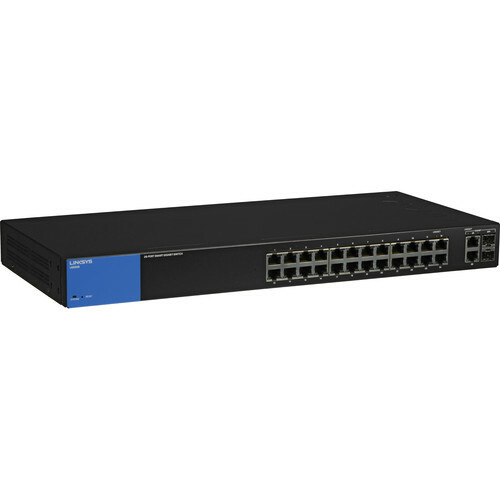 The 26 Gigabit Ethernet ports, two of which offer SFP connectivity, allow you to connect additional routers and switches to the network for easy expansion. Integrated network security features including MAC-based port security, DHCP snooping, and IP-MAC binding help to keep the network safe from intruders and attacks. Numerous QoS features ensure that traffic is prioritized properly to deliver the best possible user experience for real-time applications like voice and video along with bandwidth-intensive graphic/video file uploads and downloads. IGMP snooping limits IP multicast traffic to the ports that requested it, enabling the rest of the network to operate at peak efficiency. Unauthorized access to the network and mission-critical data is a constant concern. Linksys smart switches help secure networks through port authentication and MAC-based port security, requiring clients to authenticate themselves before any data is passed. Advanced DHCP snooping and IP-MAC binding functions ensure network integrity and help prevent network attacks. Linksys smart switches include features for quickly expanding and growing your network. Multiple high-bandwidth trunks between switches enhance availability and redundancy. Spanning Tree Protocol (STP) and Storm Control features help control planned or inadvertent cable loops. Box Dimensions (LxWxH) 19.8 x 11.8 x 3.7"
LGS326 26-Port Smart Gigabit Switch is rated 5.0 out of 5 by 1. Rated 5 out of 5 by Bevans from Solid performance Bought a few of these switches for a small office. Had a small budget, so I needed a low cost, but reliable solution. Well, I would have to say these switches deliver on both. I don't think there is another switch available at this price that comes close to matching the functionality in these switches. If you're looking for a good small network switch, this is the one.